The Breckenridge Property is a 67-acre forested parcel in Williamsburg. 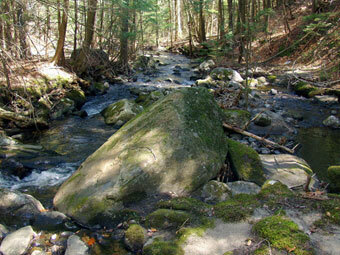 Blake Brook runs through the property and the West Branch of the Mill River forms the northeast boundary. The West Branch of the Mill River is a popular fishing area and is stocked with trout each year. Breckenridge was donated by Margaret Breckenridge to the Nature Conservancy, and later transferred to Hilltown Land Trust, which maintains the land and trail system. Most of the trails were originally built by Margaret Breckenridge’s husband, Edwin. 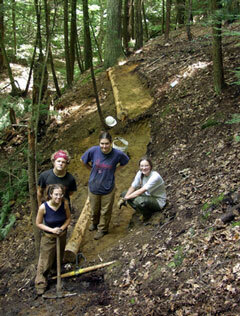 In 2003 a team of AmeriCorps workers linked the trail system to the Old Goshen Road and built the timber bridge over the Blake Brook. The principal trail is a one-mile loop with access from our parking areas and kiosks on both Old Goshen Road and Route 9. All formal trails are blazed yellow. The trail crosses Blake Brook over a wooden bridge, climbs a steep slope, then splits into a loop. A spur off the end of the loop runs along the West Branch of the Mill River. Please note that where this trail crosses a stone wall marks the boundary to private land. Note that there are no rest rooms or other facilities at this location. Old Goshen Road: Take Old Goshen Road north off Route 9, 1.1 mi. west of Williamsburg village. 0.4 mi. from Route 9, bear left at the “Y” intersection with Hemenway Road, continuing on Old Goshen Road. 1.9 mi. from Route 9, the road crosses the West Branch of the Mill River and turns to gravel. Look for a small parking pullout with room for three cars on the left about 100 yards beyond the crossing. The trail begins at the two inscribed boulders at the back of the parking area. Route 9: From the center of Williamsburg, take Route 9 north towards Goshen for 2.9 miles. Informational kiosk and parking for a dozen cars are on the right just before the Goshen town line. This short access trail will bring you to the loop trail after 150 yards.